4 LinkedIn B2B Marketing Strategies That Work. No, Really. Let me guess: You’re tired of reading “powerful” LinkedIn marketing tips that tell you how to network, how to be professional, and how to optimize your profile, aren’t you? These tips are so cookie-cutter and vague, they’re practically useless. 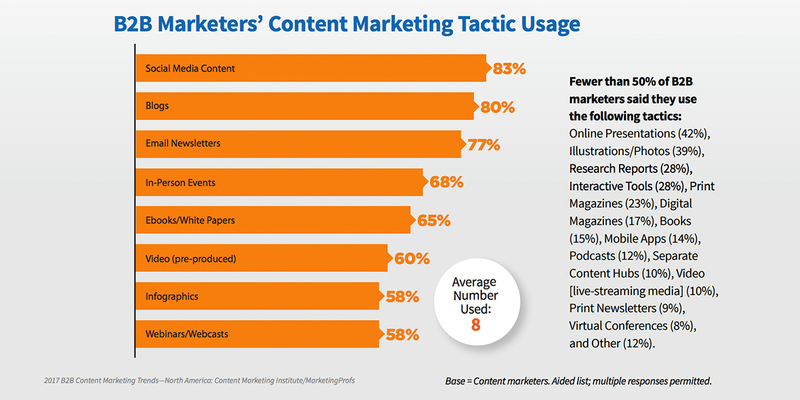 Another thing that’s frustrating is knowing how 83 percent of B2B marketers use social media content, making it the most common B2B content marketing tactic used, yet you can’t even find a decent guide on how to market your business using LinkedIn. If you want to use LinkedIn as a platform to grow your business, you’re going to need marketing tips that are specific, actionable and effective — the likes of which can bring you more leads, sales and strategic connections. In this post, I’m sharing time-tested LinkedIn marketing strategies to grow your B2B business. The strategy is pretty straightforward. Of course, it presumes you use LinkedIn’s publishing platform to publish your own content. Step 1: Read your connections’ blog posts, whether on LinkedIn or on their business blog. Look for relevant quotes and ideas that you can include in your articles. Step 2: When you write a new post, include the quote(s) you found in your connections’ articles (remember the rules of attribution, and a link back to their original post would be appreciated, too). Step 3: Once your article is published, reach out to your connections (you can direct-message them or tag them through the comments section), let them know you mentioned them in your post, and thank them for sharing their tips. You can ask them to share your article, but be subtle about it — “I’d love it if you shared this on LinkedIn and on your other social channels” will suffice. The chances your connections will share your post go up, since you mentioned them in the post. Of course, when they do share your article, you’ll get better brand visibility and recognition, which can easily nab you more leads and sales. It’s exactly because of this that marketers need to have a thriving content hub that enables them to produce quality content. Don’t mention your connections simply so you can use this strategy. Don’t name-drop. Make sure the quotes or ideas provide real value to your readers. Pretty much all of the above, only instead of including a quote from your connection, ask them if you can interview them about a topic that would be of interest to your readers. Once your post goes live, ask them to share the content with their community. This strategy has helped me get several clients from LinkedIn. But first, two quick questions. When someone adds you to their LinkedIn network, do you simply accept their invite, then ignore them? Or do you take the time to say “Hi” and thank them for adding you? Be a bit more proactive. Ask your contact if there’s an opportunity for you to collaborate. That way, they’ll likely give your LinkedIn profile a closer look and think about the possibility of working on a project with you. Can you tell me more about what you do at (the company that they are currently with)? I’d love to explore opportunities where we can both collaborate. As I mentioned, I’ve managed to get new clients by using this welcome message alone. If you are truly serious about wanting to get clients out of the platform, create your own welcome-message template, and use it to ask your new connections for opportunities to collaborate. LinkedIn’s “Keep in Touch” feature prompts you to recognize recent events in your connections’ lives, such as a new job, work anniversary or birthday. It’s a good way to start a conversation with your prospects without sounding intrusive — because if they recently celebrated a milestone, then it’s only natural for users from the same platform to congratulate them, right? In your case, however, instead of only sending them the generic, “Congrats on the work anniversary!” message from LinkedIn, you can create something that’s a bit more meaningful and warm. In fact, you can build from the welcome template that I mentioned before. You can tweak it into something like this. I’m happy for you. Congratulations on your (event). I’d love to explore opportunities where we can both collaborate. Can you tell me more about what you do? I sincerely wish you more success. Take care. Many connections will appreciate you taking the time to send a personalized message. And since you’re asking for possibilities where you can both collaborate, then the greetings you sent can yield future projects you can both work on together. * Note – Do not click “Like,” otherwise, the system will close the user’s’ profile then open the next one for you (after liking it, of course). To find out which LinkedIn users viewed your profile, just hover your mouse over to the “Profile” menu then click the “Who’s Viewed Your Profile” option. There’s a reason why these LinkedIn users viewed your profile. There’s a good chance they need someone with the same skill set as you. In short, they may be your prospective clients. Reach out to them — the right way, of course. Once again, we can use our welcome template as our foundation in creating our outreach message for those who viewed our profile. I noticed that you viewed my profile (the day when they viewed your profile). Is there something I can help you with? Also, can you tell me more about what you do at (the company that they are currently with)? I’d love to explore opportunities where we can both collaborate. Sending the users this kind of message will make it easier for them to open up to you about the reason why they looked at your profile. If they happened to be looking for professionals with the same skill set you possess, you’d be able to explain how you can help them meet their goals. Jimmy Rodela is a freelance writer and a contributor to top-tier business websites such as Business.com, Business2Community and Social Media Today. He's also the founder of Guild of Bloggers.